Thinking of throwing a party?! Why not a pizza party? It's an easy, fun, simple and delicious way to entertain your guests. Perfect for: graduations, birthdays, family gatherings, corporate lunches, office parties, dinner parties and baby showers... the possibilities are endless. Experience wood fired pizza at it's best, hand made to order on site at your location! 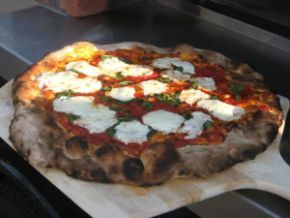 Watch as we cook pizza from our hand made authentic Italian Wood Fired oven. Even better, it's on wheels! This allows us to bring the oven to you and your guests. Phew! This oven's heavy! Travel expenses may be applied.